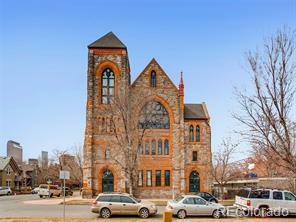 Stunning 1889 church loft in the Uptown/San Rafael neighborhoods. This unit features an open floor plan, main level gourmet eat-in kitchen with high-end stainless steel appliances, and main floor living space perfect for entertaining. The living room/dining area faces a grand open space, which is flooded with natural light. The gorgeous, light-filled upper level contains a spacious master bedroom with en-suite, reading nook, and a massive open area loft second bedroom or media area. The vast rooftop community deck is perfect for large parties or quaint gatherings. This unit also comes with a coveted garage parking space with secured storage and additional storage in the basement. Sellers have installed new hardwood floors, new carpet, updated electrical, and fresh painting. This unit is an urban dweller's dream with high-end restaurants, grocery stores, bars, downtown, and the light rail just a short walk away. Historic character, modern updates, location . . . can you ask for more?